Should you choose a garden room or conservatory? You need more living space and the obvious way to achieve it is to build into the garden. But what makes more sense: a garden room/office or a conservatory? They’ll both give you more space while giving you more opportunities to enjoy the great outdoors even when the weather’s not so great! And price-wise, the cost of a RUBICON™ garden room is very similar to that of the average conservatory. So what should you do? Obviously, we are slightly biased when it comes to talking about how practical and versatile garden rooms and garden offices are! But here are a few considerations you might want to think about. Q. Can you use a garden room all year round? A. One of the huge benefits of garden rooms is the fact that you can use them throughout the year. No matter what the weather, come rain or shine, garden rooms or a garden office really are rooms for all seasons as they’re fully insulated to the same levels as a modern (2013) house. The same cannot be said of a conservatory which is why they tend to be too cold in winter and too hot in summer. Q. How many uses could a garden room have? A. 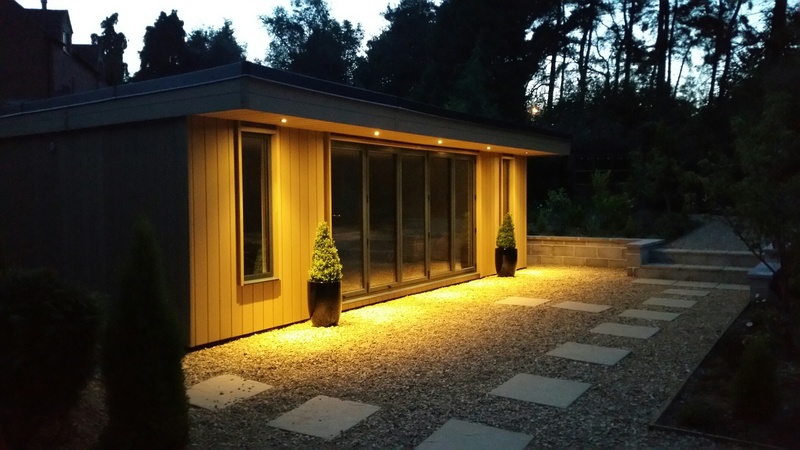 Our garden rooms have many uses - limited only by your imagination and your preferences! As well as being used as an office, we’ve seen our garden rooms become hobby rooms, gyms, kids’ playrooms, music studios, home cinemas, granny annexes, man caves, hot-tub housing and even a home pub! The possibilities are almost endless. Take a look at the drop down menu on our case studies pages for more ideas. Options are a bit more limited for a conservatory: relaxing, eating, reading the Sunday papers and housing plants over winter perhaps! Q. Can your Granny actually live in a garden room?! A. Believe it or not, yes. Garden rooms can potentially be designed as accommodation in all kinds of circumstances including for guests, relatives and people with a range of disabilities. Be aware however these will most likely require planning permission, but it’s certainly possible (and not something you could do with a conservatory). Q. Is it easier to run a home business from a garden office or conservatory? Whereas in a conservatory you’re likely to freeze and bake in equal measure as the seasons change (if it's south-facing you may want to consider a Gobi Desert survival kit). As an integrated family space they can be great – but if you want to work from there get ear plugs, as you’ll be closer to all the disruption from normal household living. Q. Does a garden room get as noisy as a conservatory when it rains? A. It’s not much fun using a conservatory when it’s pouring down (particularly considering the deluges we’re experiencing more frequently these days). If you need to use it, there’s not a lot you can do other than put up with what is at times the deafening sound of rain hammering overhead. The good news is garden rooms and garden offices come with fully insulated roofs so noise from rain (and your neighbour's lawn-mowing/dog barking/ tuneless singing/ kid yelling etc) is a lot less of a problem. Q. So are there any downsides to a RUBICON™ garden room or garden office? A. We’re struggling to think of any!